Food bloggers can be inundated with opportunities, to the point that there can be a feeling of dread going through mail each day. Press releases galore with the hopes that we will mention a product on our blogs, offers of samples to do the same and sometimes the wackiest most off the wall requests ever; a friend was just ‘invited’ to do a thorough job of researching activities for travelers in her town and doing an accompanying post all for the reward of having her site linked in the print piece. So when those bright stars appear, and they occasionally do, it’s a delight for the senses. One such communication recently came my way from Deborah with the Omni Hotel in Interlocken, located in Broomfield, Colorado which is a bit more than halfway from my home to Boulder. Would I like to join them with some friends and sample their latest specialty menu for ‘Street Food’ that would be running through April in The Tap Room? Omni Hotels invited us to “Travel the World in Just One Bite.” Sous Chef Troy Micheletti welcomed us to The Tap Room, Omni’s more casual restaurant with a wide selection of beers on tap. The Tap Room has a regular menu always available; this specialty ‘Street Food’ menu will be served through March. More than 100 chefs from San Antonio to Singapore competed to create street food inspired dishes made popular in their homeland. Troy was so generous with his time as he shared how this menu came about; providing details about each dish. Street food has evolved far beyond what I experienced when I first came to Denver and would occasionally stop at a stand for fresh, homemade tamales; it’s become a global experience, a real delight for the senses all in your own backyard. I’ll be honest; I’ve never felt the need or had the intentions to be a restaurant reviewer. I did meet one once for breakfast and felt that I should have come wearing my wide brimmed hat and large sunglasses to hide my identify. That is not what I do and I know that these visits do see restaurants put their best foot forward. However, the conversations I’ve had with their staff make it clear that customer satisfaction is their priority. Upon arriving, no one knew why we were there and I was impressed from the start with the young men greeting us in the lobby who were particularly gracious and helpful. Those first impressions mean so much. The food we experienced; the attention paid to us by the delightful Emily and our time with Troy only accentuated that first impression. Now, how about that food? There were four of us. The food put on our table could have easily fed 24. I am not kidding. They had decided that to let us really experience their ‘Street Food’ offerings that it would be best to give us actual portion sizes of SIX different menu items; served in two courses. I think we all dug in a bit with the first offerings and by the 2nd round we were taking bites and nibbles and yes, we did bring the leftovers home. I don’t know about the others but I know my daughter Emily appreciated that I was able to take her an entire meal that evening! Chicken Musakhan Sandwich – Musakhan is a common Middle Eastern dish of chicken, onions and sumac that varies by family recipe. Citrus and Braised Lamb Tostada – Braised using a secret family recipe, lamb is melded with simple ingredients served with a Latin twist. 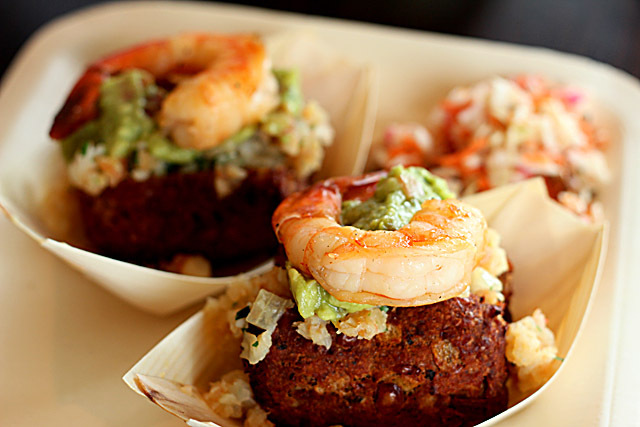 Acaraje de Orixa – Acaraje is a delicacy of the Afro-Brazilian cuisine, prepared with a ground black-eyed pea and shrimp paste, the cooked rolls are topped with a large shrimp. 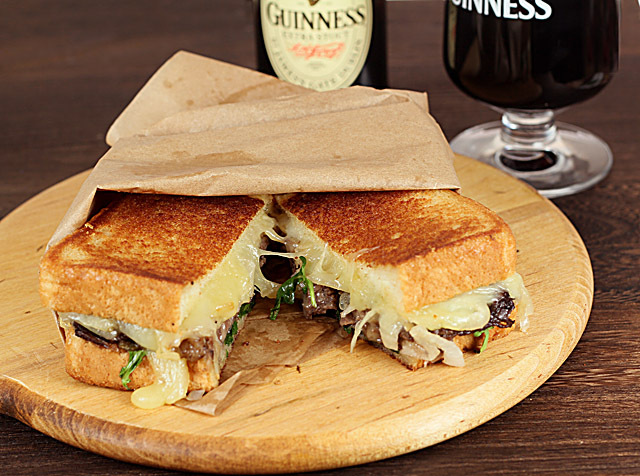 Short Rib and Vermont Cheddar Sandwich – A satisfying and savory treat bursting with New England flavors of family farm beef, native produce, Vermont Cheddar and local artisan brioche. Duck Empanada with Smoked Tomato Mayo – This empanada is filled with a flavorful duck confit paired with a sweet and smoky tomato vinaigrette featuring flavors from Latin America, France and Asia. 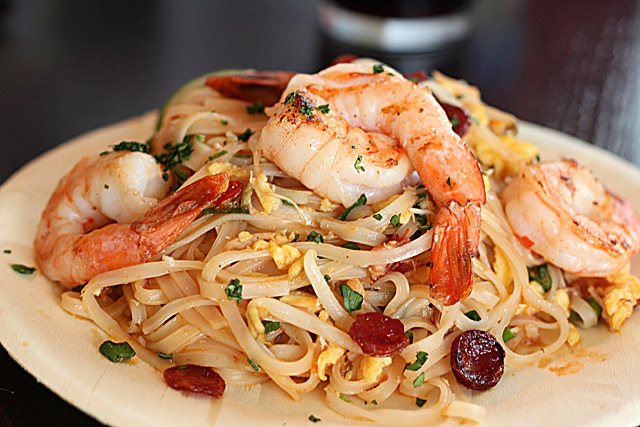 Famous Peddler’s Char Kway Teow – Stir fried flat rice noodles are a popular dish throughout Malaysia, Singapore and Indonesia. 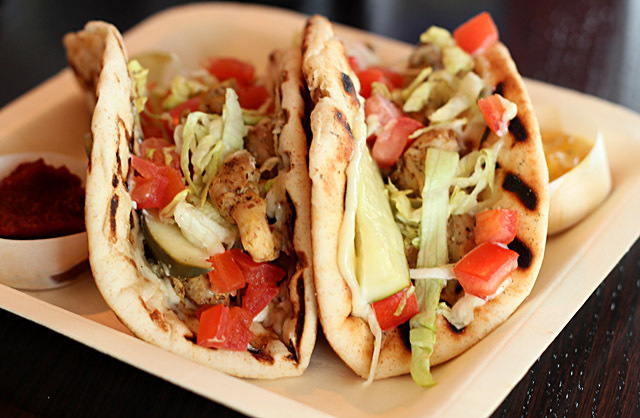 Made famous by local street food vendors, it’s presented with a modern twist. I love that they have put not only the menu but the recipes online as well…sure made it easy to re-create one of the dishes. I enjoyed everything but my favorites were the Lamb Tostadas, the Duck Empanadas and the Short Rib Sandwich…which I decided to recreate – I guess that pretty much clarifies where my top vote went doesn’t it? I made a few changes to their version, preferring to make a smaller portion and using beef stock in lieu of veal stock because it is readily available. I also added a bit of horseradish sauce to my sandwich but that is just personal preference and not a part of any recipe (but if you love beef and horseradish by all means do it!). The most difficult part? Finding the right bread. They use a brioche from a bakery in Boulder; I did not have the time between house showings to bake bread too so I finally located some Texas toast at the grocery; it had to be thick slices and that worked. This sandwich is SO good and even though the short ribs take some time on the stovetop, the actual effort to make them is pretty easy and the sandwich is amazing…you must try it too! 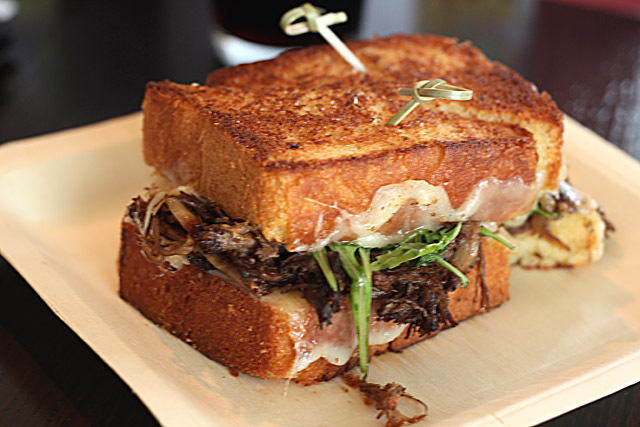 A fabulous combination of tender short rib meat, caramelized onions, white cheddar cheese and fresh arugula; altogether a great sandwich. Sprinkle Short Ribs with Salt & Pepper. Melt butter in braising pan, add Short Ribs and brown all sides. Remove Short Ribs and add carrots, onions and celery to the pan. De-glaze the pan with red wine and sherry. Add beef stock, garlic, bay leaves and thyme. Bring to a boil, reduce to medium and simmer for 2-3 minutes. Add Short Ribs back to the pan. Cover and cook on low for approximately 2 – 2.5 hours until tender. Uncover & let cool for 30 minutes. Cut meat into 1/4 in. slices, trimming excess fat. Melt butter in skillet and add onions, sprinkle with salt & pepper. Sauté onions until golden brown, add sugar and stir til melted. Assemble 8 slices of buttered bread. 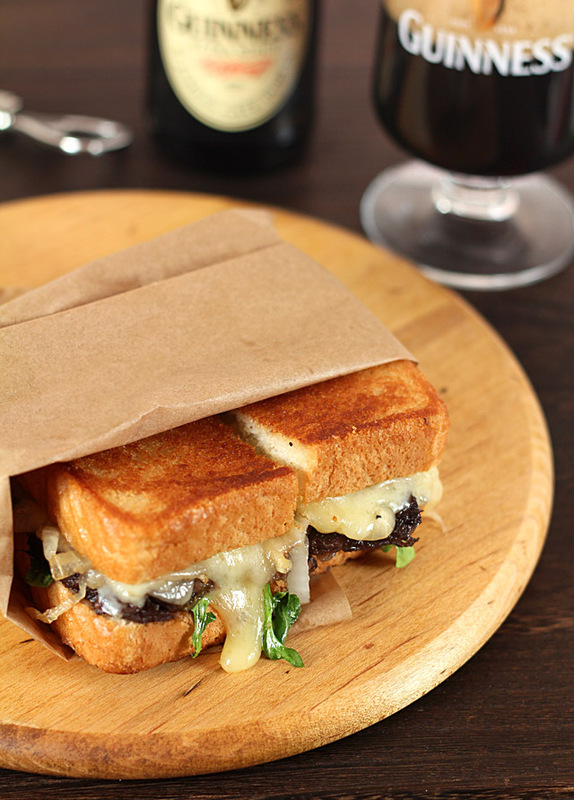 Place one slice of cheese, ½ cup of short rib meat, ¼ cup of caramelized onions and a handful or arugula on each sandwich. Heat griddle and cook sandwiches until golden brown, about 3 minutes per side. Transfer to work surface to cut in half, serve immediately. Finding good short ribs is always a problem for me. I found these at a local specialty shop so paid a premium and even then should have been more careful about what I was given. If given the option? Only get larger ribs with a greater percentage of meat to bone. I had a couple that so little meat that by the time they cooked, it was almost all bone; not what I expect for $8/lb! I've found since buying that meat that some Costco stores carry short ribs; I'm checking them out for the next time! Oh Memories of the delicious food on that snowy afternoon! And you are right, it was food for 24 people. We had leftovers for at least 2 days and we enjoyed them so much that I have been asked to “take the family” to the tap room, and not just the book club! You are lucky you are so close; I would make it a regular haunt if I were. So glad you joined us! Can’t beat short ribs! They have terrific flavor, and combine with wine so well. Never had them in a sandwich, though – really fun idea. Only downside is they’ve gotten a bit pricey in recent years. 🙁 Anyway, good stuff! Thanks. They are way too pricey if you ask me…particularly since the bone is a huge part of what we’re buying. I should have paid more attention; that butcher knew what he was doing giving me some really small ones without much meat. REALLY pricey for just a bone John! But oh so good so lesson learned and next time I’ll be more attentive because this sandwich is oh so good! Was! And so good I’m making more soon; cutting recipe in half did not leave me enough leftovers doggone it! Sounds like a great menu. Why only through March? 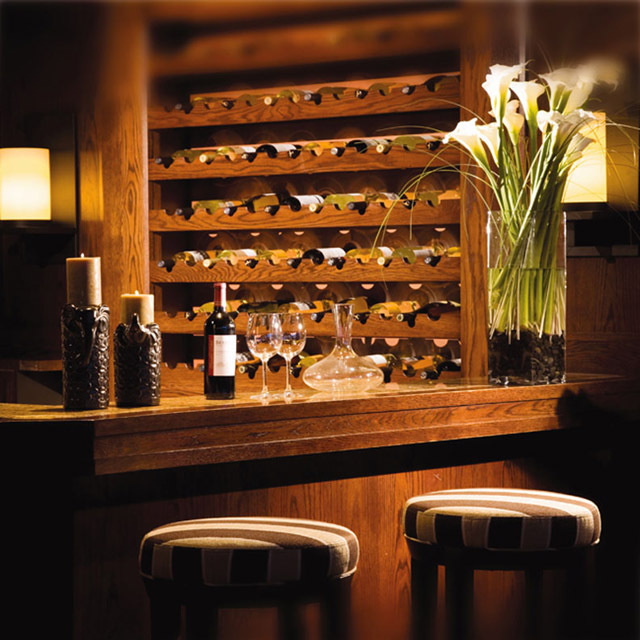 They do a lot of this type of menu; bring different regional or international tastes to the table. Not sure what is next but something will be! Wow! Excuse the drool. I am tasting this sandwich all over again and cannot believe how you recreated it at home. I am ready to try it myself as soon as I get the ribs. I’ll let you know what I find the next time I go to the Parker Costco. They are closed today for President’s Day I think, otherwise I’d be there when they opened! Wow, Barb, what a fabulous “event” or well, meal. The food looks gorgeous and I like the atmosphere of the restaurant. And how nice they share their recipes. I love the idea of the short ribs and turning part of them into these great sandwiches. Yum. I wish I got invitations like this. I just love short ribs and find them very easy to cook. The prep is usually minimal and then they just simmer away pretty much unattended while I get on with something else. This sandwich looks like an absolutely perfect way to use them! Sounds like y’all had a lovely Saturday afternoon outing. It was great fun; one real benefit of starting a local group was meeting other like minded folks (all women). We bonded as friends and have this one thing in common…or two I guess. Food and blogging about it! Oh wow, does that food look good!! The sandwich is decadent and delicious. I have been wanting short ribs perfect winter meal. 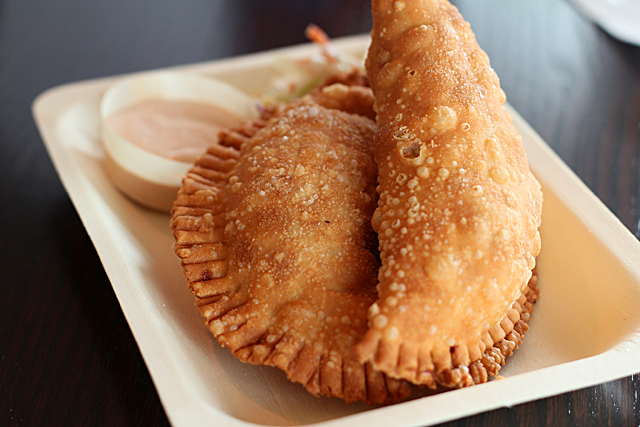 Those duck empanada’s with the smokey tomato mayo is beckoning!! That was a real favorite too but I thought these easier not only for me but readers to re-create. And eat. YUM! Beautiful sandwich Barb! This took me right back to that snowy afternoon with a good beer inside their warm bar. I know how much you loved recreating this one. I can’t wait to work on mine later on today. I love short rib recipes and can’t wait to try this one. Costco’s short ribs are hit or miss, but their packaging– or at least the packaging for stores around my area– are vacuumed pack rib end up so you can see the meat to rib ratio. Thanks for the post and I think it’s great the Omni Hotel lists their recipes (because I might try the lamb tostada too). I love they do that too…probably better than each of us hounding them for it huh?